You may remember a lovely Italian dinner at Bocellis South Perth, they also do breakfast and I’m unsurprisingly rather fond of their french toast. As with their dinners, Bocellis do a lovely, simple and inexpensive breakfast menu. On this occasion we sat in their courtyard, a nice breeze on a warm Saturday morning. We both went for the French toast and were not disappointed. 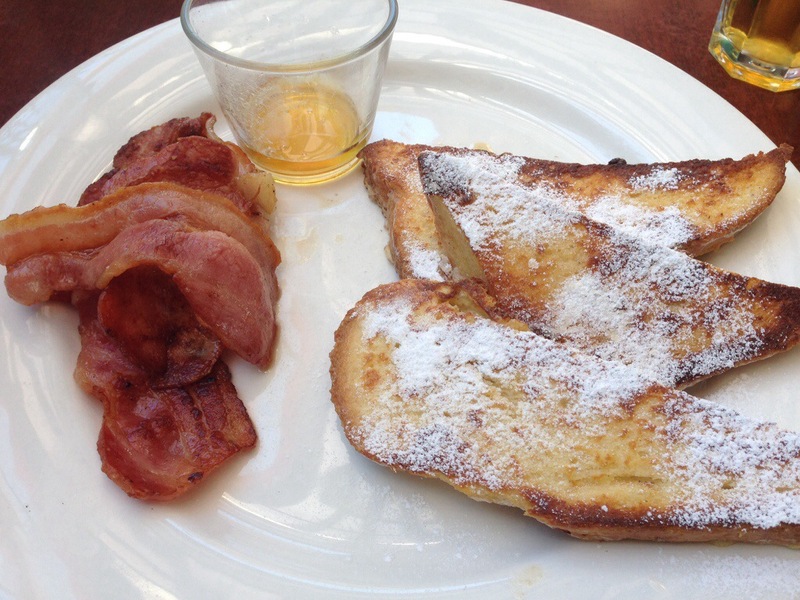 Its presentation is simple, and its flavours basic, with three pieces of toast, honey and bacon. For $10, we have yet to find cheaper French toast in Perth. What is so fantastic about this dish though, is that the toast itself shines. It is crisp on the outside with a beautiful softness to the middle, light and fluffy, it doesn’t need fancy toppings, fruit, cream, coulis or even the icing sugar to taste great, it just is. The honey and bacon work as accompaniments to the toast, the sweet honey and crispy bacon are delicious combined with the flavoursome french toast. Bocellis may not serve fancy sides, creme anglaise, or berry coulis’ but they do what they do well and for an unbeatable price! A word of caution though, we usually order juices or chocolate based drinks here as they don’t do great coffee, however they’re just up the road from Halo Espresso so we generally get a takeaway coffee there instead.